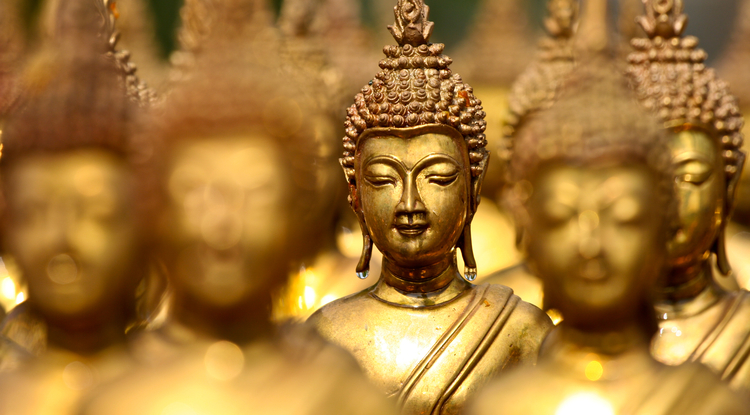 Research, teaching and outreach will focus on the worldwide spread of Buddhist traditions. UA Center for Buddhist Studies director Jiang Wu (right) visited the Taiwan Sheng Yen Education Foundation in March. The University of Arizona’s new Center for Buddhist Studies will create a research hub to explore the religious, intellectual, social, cultural and textual traditions of the world’s fourth-largest faith. With Buddhist traditions becoming more familiar and practitioners growing more common in the U.S., the UA will draw on existing faculty expertise in East Asian studies and religious studies to promote academic research on the Buddhist tradition. Residing in the College of Humanities, the Center for Buddhist Studies will be a home for faculty research, sponsor a lecture series, support student scholarships, host academic conferences and visiting scholars, and continue to preserve Buddhist heritage in its textual and artistic forms. The center formalizes the curriculum, research and outreach activities already underway at the UA, while recognizing opportunities created by the rise of global Asian cultures and markets as well as the rise of Buddhism-inspired social movements in the West, said director Jiang Wu. Wu, who teaches Chinese thought, religion and classical Chinese, is an expert on Chinese Zen Buddhism of the 17th century and the Chinese Buddhist canon. Albert Welter, the East Asian studies department head who arrived at the UA in 2013, is an expert in Chinese Zen Buddhism as well, although his research focuses on earlier traditions, from the ninth to 13th centuries. Also at the UA are professors studying religious traditions in Japan, India and Tibet, as well as experts in mindfulness and contemplative studies. Their research excels in areas such as archaeology of Indian Buddhism, South Asian religions, Chan/Zen Buddhism in East Asia, early modern and modern East Asian religions, Buddhist canon studies, Buddhist cultural and sacred geography, Tibetan Buddhism, medical humanities and contemplative pedagogy. In addition to the existing B.A., M.A. and Ph.D. programs in East Asian studies, the UA began offering a minor in Buddhist studies in 2015 and has two summer study-abroad programs with a focus on Buddhism, in Kyoto and Bhutan. Buddhist studies as an academic discipline derives from almost 200 years ago in Europe, where Christian missionaries and scholars studied the Asian texts to learn about those parts of the world. Buddhist studies has retained its predominantly textual approach, becoming very centered on traditional expressions of Buddhism. Wu’s goal for the UA center is a more expansive approach, calling on advanced digital tools to explore not only the sacred texts but also the geographic spread of Buddhism and its sacred sites. In order to create a new model of humanities studies, the center also will promote the ideal of service learning to encourage students to enrich their experience through community service and social engagement. The center also will expand student opportunities to gain experience in field research. The launch of the Center for Buddhist Studies occurs in tandem with the launch of the UA’s Center for Digital Humanities and Department of Public and Applied Humanities. Wu already has plans for collaborative, cross-disciplinary research that will make the most of both areas. One research project calls for the digital mapping of Buddhist sites, including monasteries, across the world, showing not only the spread of Buddhism but the development of distinct regional traditions and variations tied to geography and existing traditions. Another project will develop software and algorithms with the artificial intelligence and deep learning utilities to study digitized Buddhist texts. Rare texts that Wu has collected over the years will be cataloged, digitized and publicized in a specialized archive. National Leader in the Making? With its expansive and multidisciplinary research in the humanities — as well as the landscape of Tucson and the Sonoran Desert — the UA College of Humanities has the potential to become a national leader in Buddhist studies, Wu said. Retreat and meditation centers are common in the desert, and the rich Native traditions of the region have interesting connections and similarities with Buddhism that Wu is interested in exploring further. The Tucson Buddhist community supports the founding of the center. The idea of establishing the center was conceived during the meetings of the Contemplative Traditions Working Group organized by the UA Confluencenter for Creative Inquiry. For now, the Center for Buddhist Studies will focus on planning to host a two-day international conference on Chan/Zen Buddhism in East Asia in late March of 2018, revealing its activities and ambition to other prominent scholars in the field.